This week we're celebrating Beverly Allen's release of Bloom and Doom and while I don't own or work in a flower shop, my husband and I ran a commercial greenhouse operation for five years and since this week's theme is about flowers, I thought this would be an opportune time to show you our operation. The flower shop in Bloom and Doom takes deliveries of specially-grown flowers and arranges them into gorgeous arrangements in whatever fashion the client requests. Audrey uses her knowledge of the language of flowers to ensure her clients send the right message with the flowers they've chosen to use. 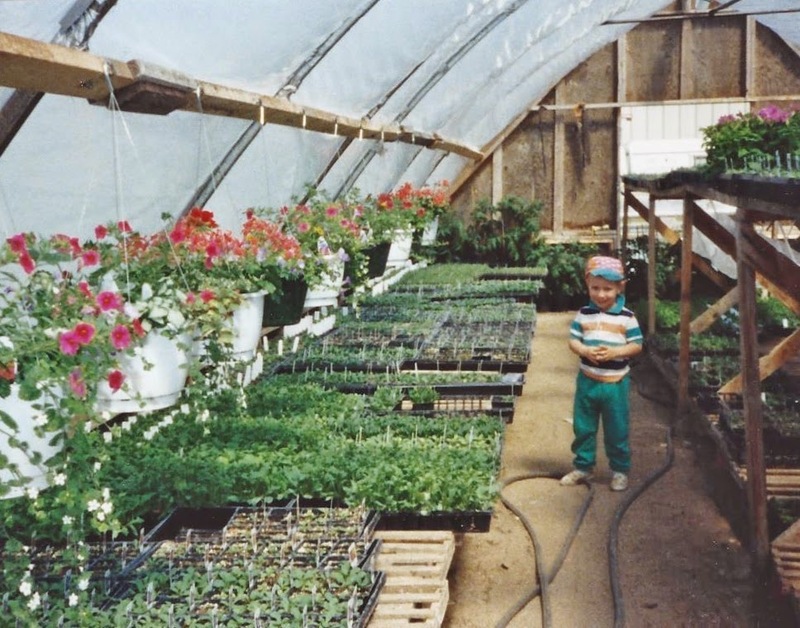 Our greenhouse was a bedding plant operation and although we started growing Spanish Onions and Patio Tomatoes in January, we were only open to the public from May 1st to June 30th. 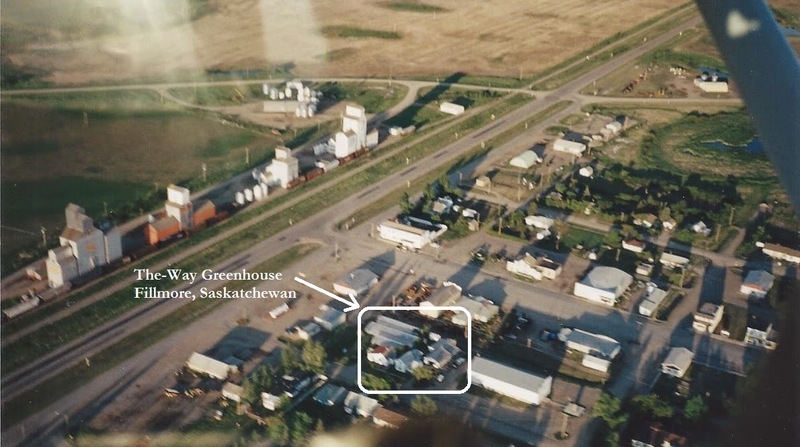 This aerial shot shows our Fillmore, Saskatchewan location on the northern part of town. I usually spent September and October ordering all the cuttings and seeds. February is when the Petunia seeds were started so we'd have them ready for hanging baskets at the beginning of May since people liked giving them for Mother's Day. Every Petunia color had it's own seeding box and we also needed them for the picotee edged ones, the doubles, the stars, the minis, etc. Below are 2 boxes of seedlings. They develop a set of seed leaves first but we wait until they have their first set of true leaves before we plant them. The true leaves will look different, so the following pics aren't ready yet, but they will be in a couple days and then after transplanting, what filled one 12" x 16" box will require 40-50 square feet of shelf space. Nelson was in charge of the watering and knew the perfect temperature and pressure to give the plants. They liked warm water, but some - like the geraniums - didn't like it on their leaves or they'd get spotty. If you used the wrong nozzle on the end of the watering wand, the water could spray out and knock the little seedlings over, so you had to pay attention to what you were doing. The-Way Greenhouse with Nelson watering "B"
As you can see, we had a lot of seedlings growing at the same time and employed several people to help us during transplanting season. The caption above shows Nelson working in "B" greenhouse. 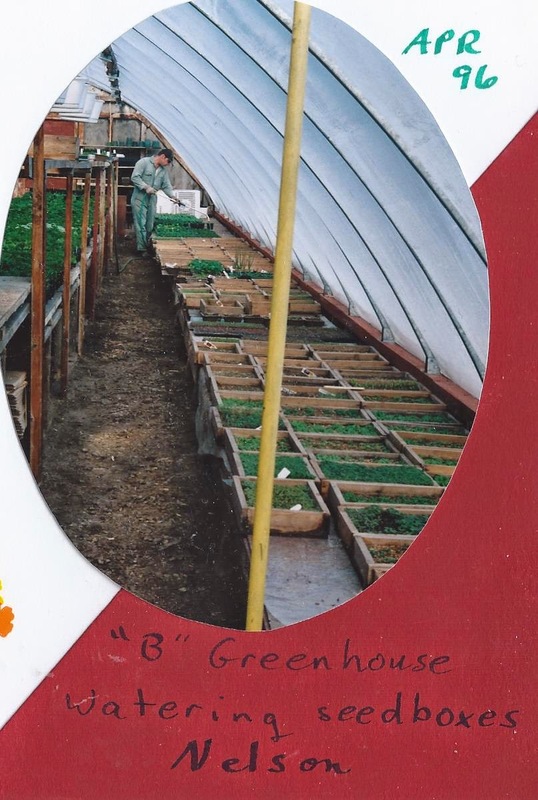 We gave them each a letter starting with the garage greenhouse as an easy way of identification, thus we had A, B, C, D, and the Seed Room as well as the north lean-to and south lean-to. A big painted letter on each door and we were good to go. After a couple years we did away with the wooden seed boxes and switched to hygienic plastic ones. Here's the other side of "B" with shade control to keep the sun from burning the seeds that need light to germinate. This next one is "D" - the smallest of the hooped greenhouses. That's Nicky, who was just itching to play the tag game... you know the one where you buy a geranium with a tag that says Scarlet and when it blooms the color is white? That's the switcheroo tag game. I'm glad to say we didn't have many complaints about the wrong colors, which is a credit to Nicky's control. The-Way Greenhouse with Nicky in "D"
Most people want them blooming and so that's what we sold, but for a robust plant with lots of branches - meaning more flowers - they really should be planted before they reach the flowering stage. If you buy it in flower, then the flowers should be snipped off at the stem so the plant's energy will go into putting down roots instead of trying to look pretty. It really needs to come out of transplant shock to look its best. 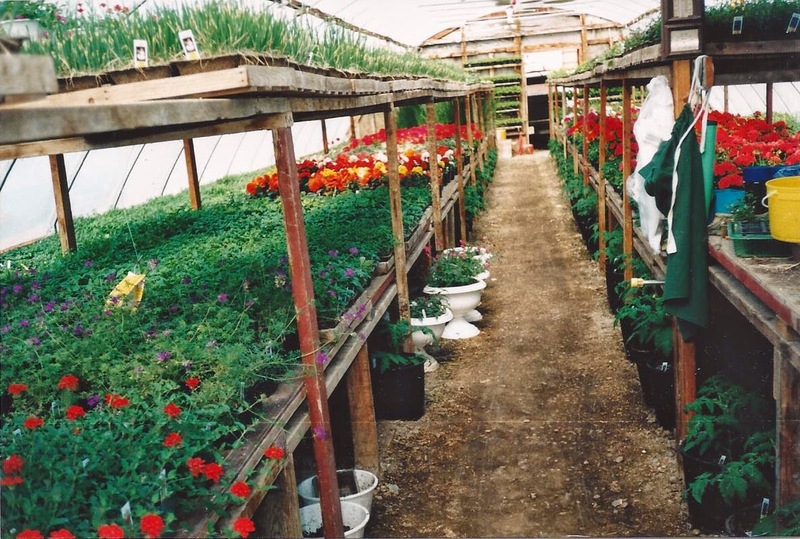 I loved working in the greenhouse, right from seeding to selling. This next photo would have been taken at the beginning to middle of April and it was always nice to walk from the cool air into the earthy-scented warm air beneath the plastic. I especially liked the smell in February after walking through snow drifts to get to the Seed Room. Such a contrast, but to walk in and see new life growing after walking through a frigid work was rather exhilarating. Hmmm... is Nicky looking at me or the tags? It looks like he might be crossing his arms as a way to keep his hands out of trouble - especially with those super big tags facing him. The-Way Greenhouse with Nicky in "C"
Although we gave the customers free reign of the hooped greenhouses and cold frames, we used the huge "C" greenhouse as our main showroom for the potted plants like the zonal, ivy, and pansy geraniums, begonias, verbenas, impatiens for sun and shade, wave petunias, herbs, and all sorts of ivy and fillers for hanging baskets and decorative pots. Eight hundred or so cuttings would arrive in February and take me a couple weeks to transplant. A trim at the end of Mar took another week or so, but the results were beautiful. One customer had severe allergies and would stand outside at the end of "C" and send her husband in to do the buying. She did the picking though, yelling at him down the aisle of each greenhouse he entered. I often thought of that couple while Beta-reading the sequel to Bloom and Doom because there is a cop in the story who is allergic to flowers as well and Bev/Barb made him so very realistic. 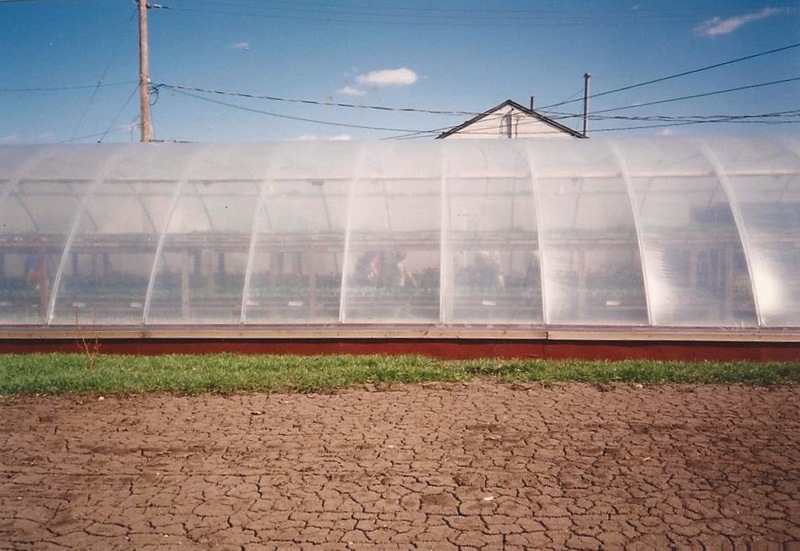 This is an excellent photo of "D" to show the difference between inside and outside a greenhouse. Inside, everything is watered daily and not dependent on the weather. Every weekend during May and June we'd head out to the Farmer's Markets and other venues. Planning started a couple days before where we'd find a spot to set our orders aside. The day before the event we'd load one truck and trailer outfit at a time ensuing the plants were well-watered first. 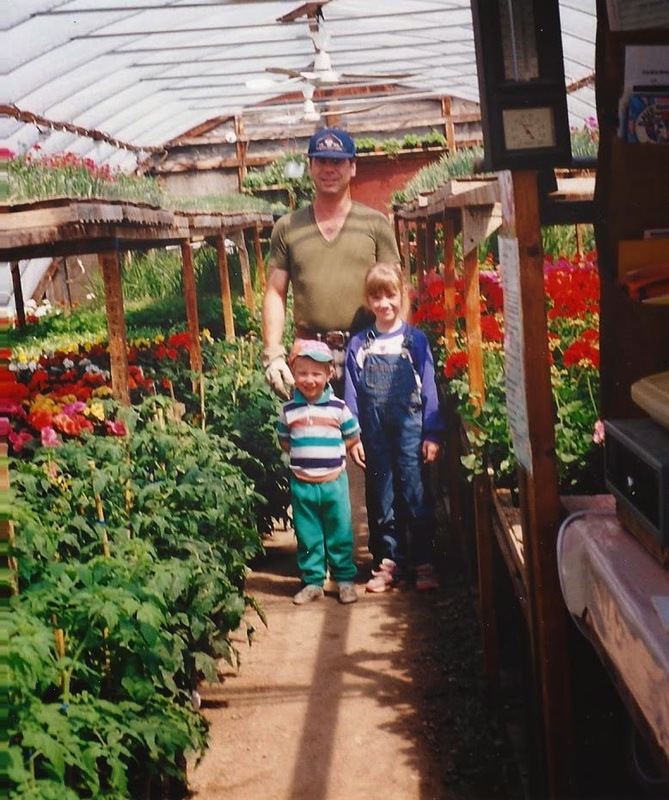 We also had to ensure we had a couple employees to do the selling and one to do the watering because once the greenhouse opened for the season, customers liked to be given the grand tour, and sometimes by the time the watering was finished, you had to start again. So each needed to know what their job was for the day while we were gone. 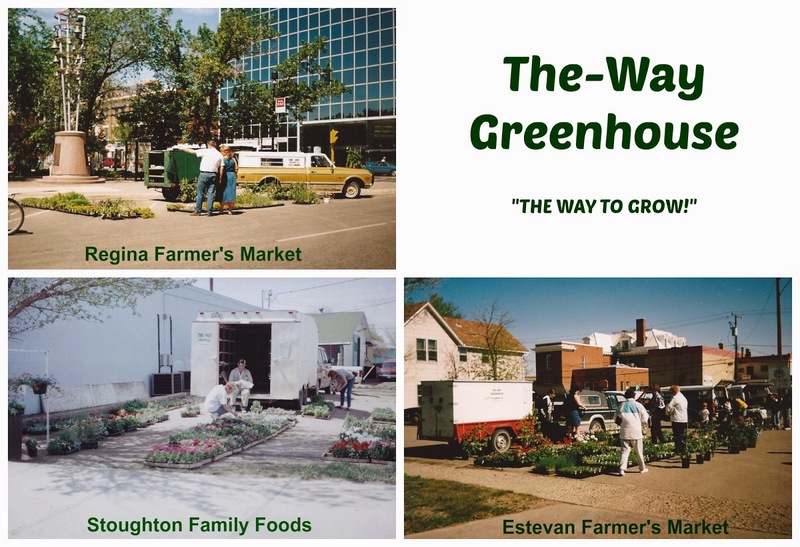 Nelson's father who started the greenhouse operation would take his 1/2-ton and custom-built wooden trailer to the Regina Farmer's Market. Nelson would take our van and custom-made metal greenhouse trailer to whatever venue we'd been booked into. The photo below is where we'd set up for 2-3 days a year beside the Stoughton Family Food store. Every Saturday I would take a teen employee and head to the Estevan Farmer's Market with my 1/4-ton and trailer. All vehicles, including the family van, would be packed tight with built-in shelving (paint cans and plywood). On average we'd come back with 40% of our stock left depending on the weather, and we'd have to unload and water everything. What we brought back looked worse for wear and needed a week to get over the 'travel shock' and perk up again. 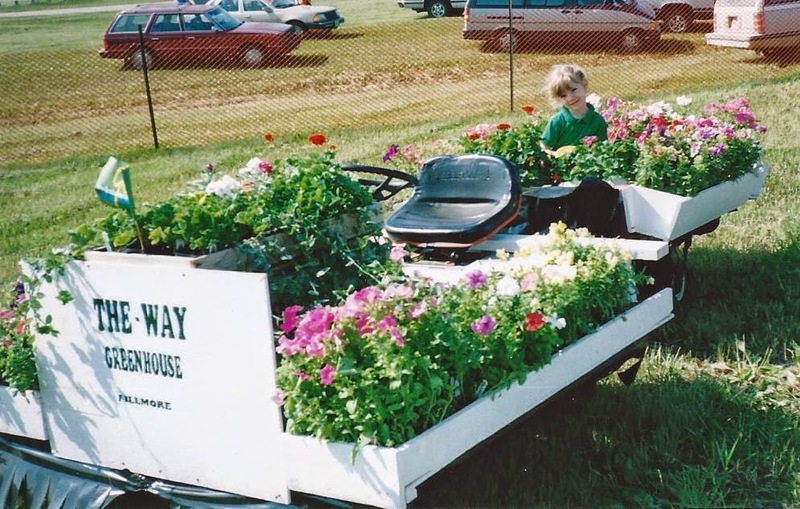 July was spent cleaning out the greenhouses and getting our float ready for the parades which preceded the local fairs. Nelson made this float to sit on his lawn mower and trailer. He'd drive. Crystal would walk beside the trailer holding Jessie who sat on a little chair. Both girls would throw candies to the kids along the route. My final shot is "C" in full bloom with my happy workers standing beside the Patio Tomatoes and waiting for their next orders. Oh look... Nicky has his hands behind his back. Such a good little boy. 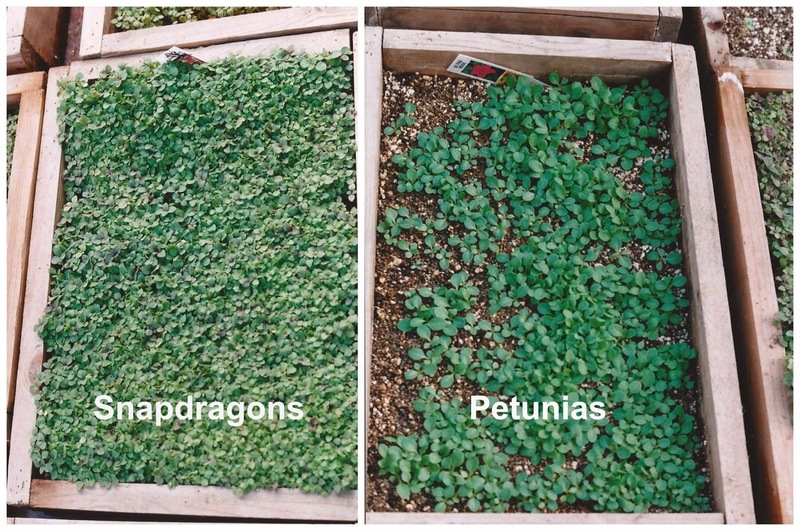 And there you have my adventure in the world of bedding plants. Now it's your turn... 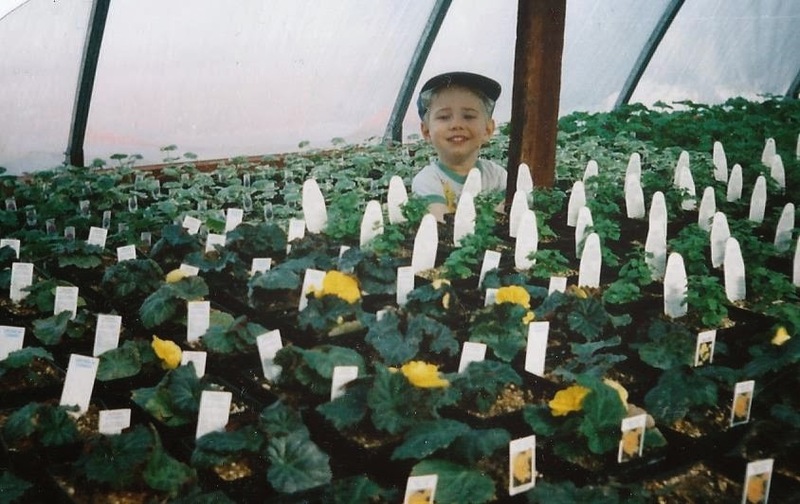 I'll tell you upfront that except for our greenhouse operation and me taking the Ontario Master Gardener's course I haven't any formal training in plants or greenhouse operations. Knowing that, do you have a flower question? We'll do our best to answer it. Oh! Oh! Anita! Fabulous post. Audrey Bloom has a local grower, and now I know who to go to with questions about his greenhouses and seedlings and such! Sending all my flower-loving friends over immediately, especially if they have flower questions. And for our visitors, remember, if you leave a comment and a valid email in safe mode, ie: Gardener (at) work (dot) com, you're entered to win a signed copy of BLOOM AND DOOM. So glad you like it Barb/Bev. And thanks for the reminder about the draw! Readers certainly don't want to miss out on your cozy and they don't need to ask a flower-related question to get in on the draw... they just need to comment. 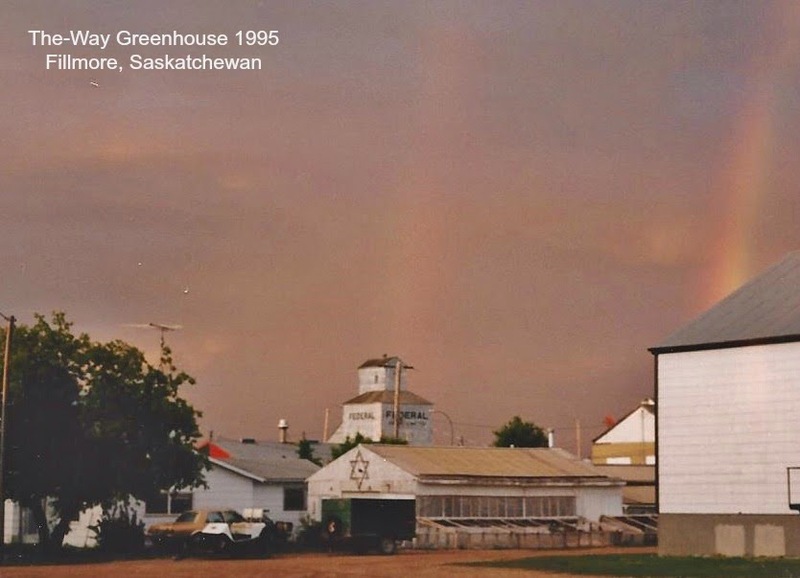 Barb, you reminded me that it was the owner of Fox Valley Greenhouses in Fort Qu'Appelle who taught me how to trim the geraniums to a successful product. I happened to be driving by before opening day back in the late 90's and went in to visit owner-to-owner. She was trimming geraniums and my shock at her snipping turned to admiration when I saw her showroom. A European lady with a long family tradition of growing, she knew what she was doing and I was eager to learn. So a big bouquet going out to her. Wow! A greenhouse sounds like a lot of work! One of my good friends actually works in a local greenhouse and has been there full time since February. I'll have to ask her more about what she's doing. I do know she is busy! I, on the other hand, just show up in the greenhouse in mid to late May to buy my bedding plants. Elaine, now that we don't have the greenhouse any longer I'm back to buying plants again. I tried building myself a small one here on the farm but it didn't work as I had no way to heat it without expending a bundle of bucks. I miss the shock to the senses of walking into a moist, earthy greenhouse in Jan-Feb, and I miss the process of seeding, transplanting, trimming, etc. I didn't mind the long hours, nor the physical labor involved because each step showed results. When our teenager helped, she hated the feeling of the potting soil mix beneath her nails and she often wore the thin latex gloves. But I didn't mind poking my index finger in the wet earth to prepare it for a new seedling as long as the mixture hadn't been packed down. It was too hard then. I still can't pass a greenhouse without rubber-necking to see what's growing. I do have a flower question, Anita. Do you have any recommendations for shady spots? I have an old well cover that there's a mound of dirt around, and the previous owner had just put in a bunch of tiger lilies. And the problem with that is that they're really pretty--for about a week out of the year. Then they die off and it looks hideous. I'd like to put in things that flower longer or stagger, so that there's always something in bloom. Suggestions? Well, I was thinking variegated hostas because they are perennials and their foliage would blend in with the lilies, but then you mentioned blooming and so that's out because their piddly bloom doesn't last long at all. For a blast of color, impatiens (pronounced impatience) are great for the New York area. Some colors like a bit of sun though so it's best to get the color mix. The large fibrous begonias work well in shade as you can see in the photo of Nick peering over the large yellow flowers where we had to keep the row above them covered or we'd start losing them. But begonias can be tricky to water and therefore hard to keep in blossom in the ground. Although petunias love the sun, some colors will tolerate shade. The Wave varieties will spread 2-4 feet depending on color and will continue to bloom until frost if you dead-head them. The thing is, some sun-loving plants work well in a shade area because the area around it is bright. The sun doesn't need to kiss the plant for it to survive, it's the quality of light and how filtered it is. Also, how hot/cold does the area get? What type of soil (acidic?) is it and how much precipitation will it receive? You're right about staggered planting for all-season bloom. So while your lilies are growing, what else can be blooming? Since you can't trim the dying leaves off your lilies, what can you use to camouflage them? Different heights of marigolds would be one of my first experiments. 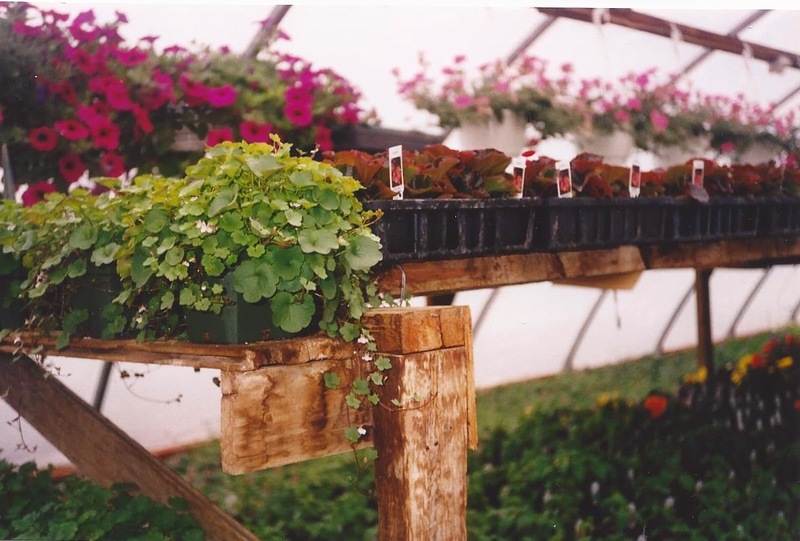 A crucial part of lily growing is to allow their leaves to die naturally, so as they droop, is there enough room to fall over without covering your impatiens, begonias, marigolds, etc? Great post, Anita. I love learning new things about you (and the other Inkies). I'd love to learn more from you! I have a brownish thumb, except with roses, lavender, tomatoes and squash. Those I seem to manage just fine. Thanks, Susie. I envy you the ability to grow lavender. I tried to grow it when I grew dried flowers for sale, but I could never manage it. Same for roses. But the tomatoes - we used to grow about 30 varieties in the greenhouse including some heirloom varieties where I had to save the seed myself. But I'm terrible with houseplants. Except aloe vera which I always have on hand for cuts and scrapes. Anita, can we just have a Vulcan mind meld? I've got some of my seeds started for the garden this year (flowers fail me, for the most part, so it's just veggies) and every year I have the same issue: spindly, leggy seedlings that get really tall and then collapse. What am I doing wrong? 1. Not enough light! They're reaching for it! 2. Overcrowding also makes them stretch for the light! Do you have a grow-light or are you using a sunny window? A sunny window only works if you rotate the seedlings every 2-3 hrs otherwise they stretch for the light! 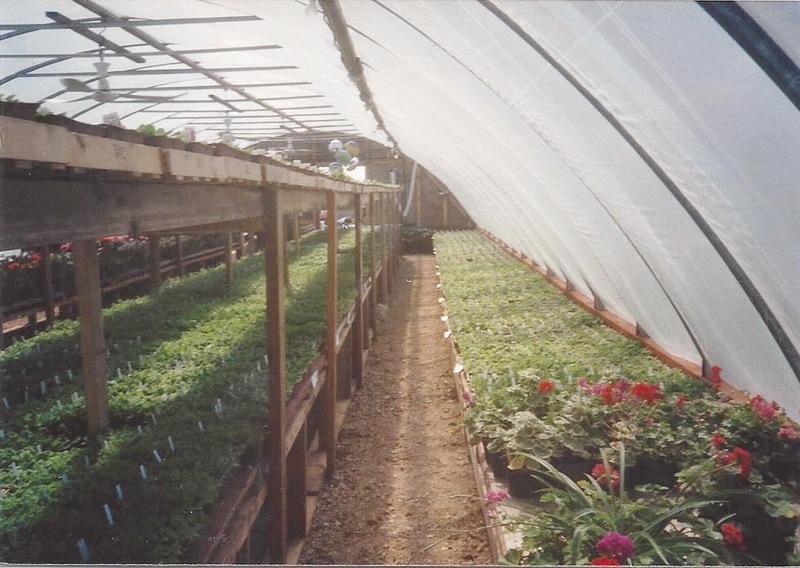 The beauty of a greenhouse is that it enables light to surround your seedlings. If you don't have a greenhouse, invest in a 4 foot fluorescent light fixture and hang from the ceiling by hooks using chains. You don't need the expensive ultraviolet tubes - just ensure you have an equal number of COOL and WARM lights. They are sold separately wherever fluorescent lights are sold. If your light fixture needs 2 tubes, get 1 of each. If your fixture needs 4 tubes, get 2 of each, etc. And alternate them as you set them in place. The cool and warm lights will balance each other and provide the optimum growth. And then put the lights about 4-6" above the plants. Trust me, they won't burn, but you need to keep an eye on them and raise the light fixture as they grow (hence the chains). Remember to keep the soil moist as the lights will dry it out. And never top water seedlings! Always set the container into a tray or basin to force the roots to go searching for the water. That will develop a strong root system. Just remember to take them out once the soil is moist or you'll water-log them. What you're looking for are short, stocky plants with lots of leaves and a dark green color. That's what I was afraid of... every year we have this lovely stretch of sunny days in February, and then I get all excited and plant my seeds. And then we have a month (or two) of clouds and snow and rain, and there's not enough light in the window. I did buy a grow light this year, just a little one, and have it suspended over the trays. They're in a south-facing window, too. I'll start rotating them more often, I didn't realize they needed to be turned so frequently. Thanks, Anita, for sharing your wisdom! You're welcome, Niki. Good that you bought a grow light but remember that the don't want much space between light and plants. And you don't need to turn them under the lights unless they're under the ends or edges. Having both a grow light and a south window isn't such a great idea though unless you really can turn them often. The reason being is that the sun is so much stronger than the grow lights the little guys will strain to reach it unless the light is filtered by sheers or some other lacy material. Leave your grow lights on for 18-20 hrs a day if you can. A timer works great. Thanks, Suzie. I deliberated before posting it because it seemed selfish to promote something I did when I want to promote something Barb/Bev did, but it seems to have worked out. And about those geraniums... we sold the citronella geraniums too. Their flowers are insignificat and the leaves are very serrated and airy. People set them on their steps or verandah so that the door swishes past them whenever someone goes through. This releases a pouffe of lemon scent which supposedly keeps the flies and mosquitoes out of the house. Brushing your hands across the leaves sends the scent drifting and also covers your hands. A natural deterrent and very effective. No, not selfish. I'm so glad you did this. It was so interesting. And now I know who to go to if I need help with greenhouses or flower growing! I think it's fantastic. Oh, I would live a geranium that smells like lemons. I will have to look for one. And Anita, this is not selfish at all. I'm very happy you did this, and I think Barb is, too. Plus, we all have a new go-to source for all things flower related. And, Anita, I don't think you have a selfish bone in your body. My hubby will be thrilled if I can close the sheers on those windows! That's the side of the house his desk is on and the glare drives him batty. I loved this post, Anita, and I have to say it was practically smell-a-vision for me. 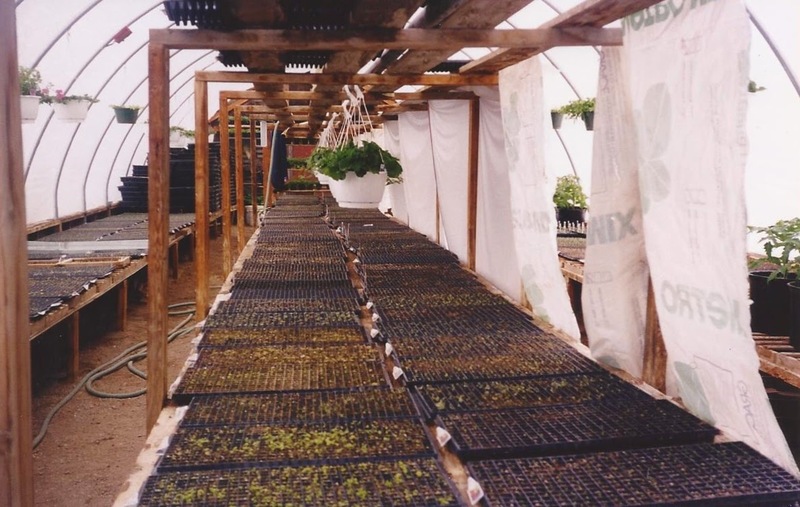 For a couple years at work I did a lot of greenhouse work and there 's nothing like the smell of wet planting material in that warm, moist environment. And - it was WARM and sunny and a delight on a winter's day. I'm a big fan of the whole process from seed to plant and then in the ground. Loved the photos of your family the best! 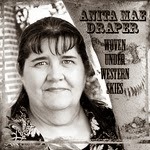 I always love your pictures and when you share about your life, Anita. A very heartfelt thank you, Lisa. Well, it's funny that I can grow things outside in a garden and inside a greenhouse, but not in my house. I think it's because outside I can play in the dirt and splash in the water, but I have to take care in the house. So I don't water enough because I don't want to make a mess or else I water too much and then cringe at the result. But I love living among greenery. btw, I thought of you the other day as I read a 1912 article on hockey. They were saying it was a good game but not worth the price of admission without a decent fight. Ha! Thanks, DebH. Poor soil can easily be fixed by adding compost. When we lived in Ontario and started a garden by ripping up the turf, we added 5 quarter-ton loads of mushroom compost to the soil. That was a lot of work shovelling it all off the truck, but so worth it. It was the best garden we ever had. Planter boxes need intense gardening to look good. They always need watering. They use up the nutrients in the soil quickly so you need to keep fertilizing to keep them looking good. And they need constant dead-heading to keep the blooms going and stop the plant from going to seed. Constant attention. Like pets.